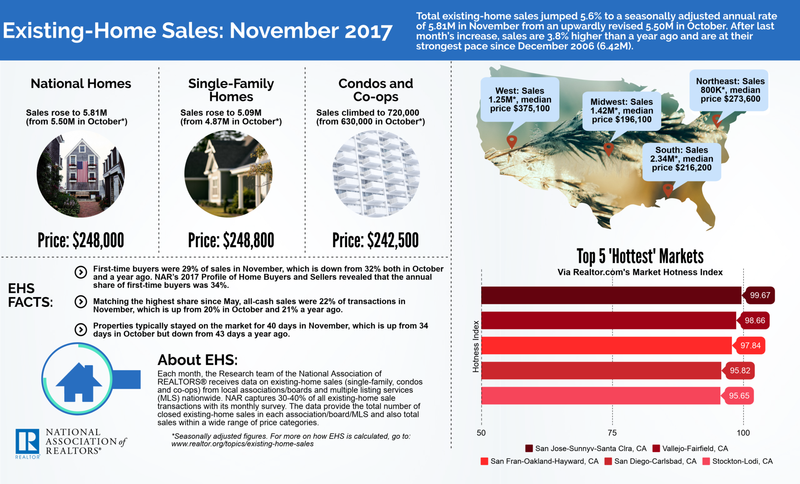 Existing-home sales increased 5.6 percent to a seasonally adjusted annual rate (SAAR) of 5.81 million in November — up from an upwardly revised 5.50 in October, the National Association of Realtors reported today. 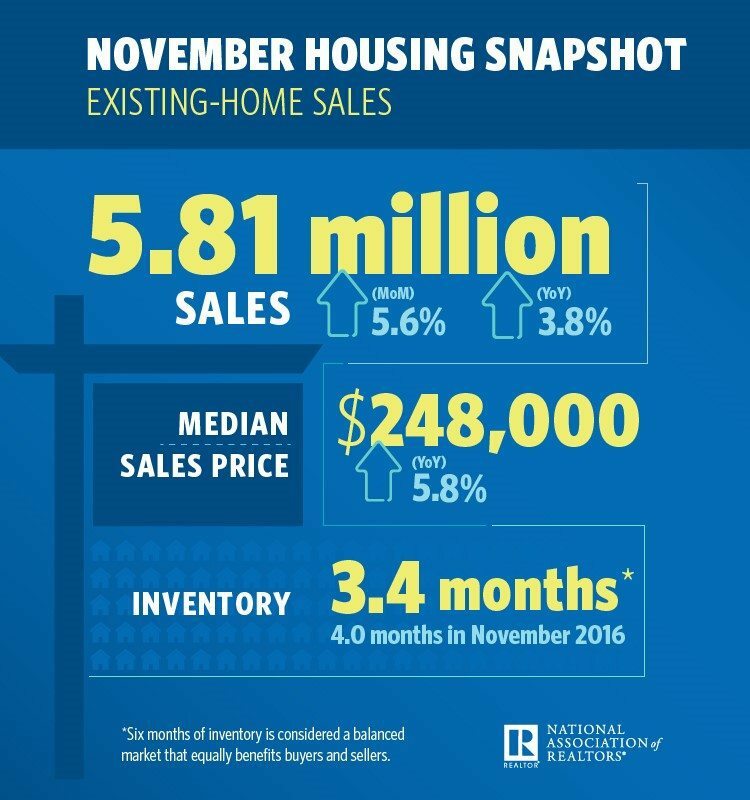 This month’s sales pace is 3.8 percent above November 2016 and is the strongest sales pace seen since December 2006 (6.42 million). The median existing-home price for all housing types in rose 5.8 percent to $248,000, making November the 69th month in a row to see year-over-year gains. Total housing inventory fell 7.2 percent points month-over-month to 1.67 million homes for sale, while year-over-year inventory dropped 9.7 percentage points, the 30th consecutive month of year-over-year declines. Unsold inventory is at a 3.4-month supply, a 4.0 percent year-over-year decline. NAR Chief Economist Lawrence Yun says “move-up” buyers — who have hefty down payments — and all-cash buyers are driving the market, leaving first-time buyers who can’t compete in the dust. “The odds of closing on a home are much better at the upper end of the market, where inventory conditions continue to be markedly better,” Yun added. “The elevated presence of investors paying in cash continues to add a layer of frustration to the supply and affordability headwinds aspiring first-time buyers are experiencing. Distressed sales, which include foreclosures and short sales, were at 4 percent — unchanged from last month and a year ago. Three percent of October sales were foreclosures, and 1 percent were short sales. Single-family home sales were at a SAAR of 5.09 million — a 4.5 percentage point month-over-month and a 3.2 percentage point year-over-year increase. The sales price for single-family homes increased by 5.4 percentage points to $242,500. Existing condominium and co-op sales increased 14.3 percentage points to a SAAR of 720,000 units, 7.5 percentage points above a year ago. The median existing condo price in September was $242,500 — up 8.8 percentage points from 2016. “November existing-home sales in the Northeast leaped 6.7 percent to an annual rate of 800,000, (unchanged from a year ago). The median price in the Northeast was $273,600, which is 4.0 percent above November 2016.